Summary: An acceptable but not a spectacular set of results from this restaurant group, with the second half showing a slower rate of expansion. I also note revenue per outlet has declined while management is hinting strongly at greater investment spend. Nonetheless, the board is a class act, the opening schedule for new restaurants is accelerating and the longer-term potential remains sizeable. I continue to hold. I felt TAST’s 2015 progress was acceptable, but not spectacular. Perhaps I was a little spoilt with the preceding bumper results, but I was expecting a greater rate of expansion. The 2015 figures showed revenue up 20% to £35.8m and operating profit before pre-opening costs up 28% to £3.8m. Great stuff — but the first half had already seen revenue up 24% and operating profit before pre-opening costs up 41%. As such, the second half showed a slower rate of growth. Last year saw TAST open a net 12 new sites to take the group’s estate to 48 restaurants. All but one of TAST’s new sites for 2015 was located outside of London and I suppose these new locations will probably struggle to reach the turnover that TAST’s established sites in the capital can produce. However, I do note that TAST opened a net 8 sites in 2014 — again mostly outside of London — and during that year the group generated extra revenue of £6.5m. And yet today’s results showed more sites had opened in 2015, but the extra revenue was less at £6.0m. It’s all a bit confusing — but at least TAST has shown some inconsistency before with its revenue and extra sites. During 2012 for example, 5 new sites were opened and revenue increased by £4.7m. And yet for 2013, another 5 new sites were opened… but revenue advanced by only £3.9m. All told, I’d like to think the current year will see much more than £6m added to the top line — especially as 15 new sites are now planned. “We are now preparing for an acceleration in the rollout programme with the appointment of David Street as property director and a number of key business functions will be expanded and strengthened to facilitate this more rapid growth. A significant investment will be made to upgrade the existing restaurant websites and greatly enhance the entire digital marketing strategy for the Group, which will increase the reach and recognition of all the Tasty brands. To ensure that we retain our high level of food quality and consistency we will be investing in Tasty’s Central Kitchen’s infrastructure. Just so you know, last year the average TAST restaurant employee was paid about £16k and the 836 restaurant managers, chefs, waiters and barmen were paid 36% of the company’s entire revenue. TAST’s expansion continues to be funded by debt. The full year witnessed TAST’s net cash position of £1.3m turn into net debt of £3.5m as the business spent £9.8m on new restaurants. With TAST’s expansion set to increase from 12 to 15 new outlets for 2016, my rough sums suggest the firm will need to take on more debt to fund its growth. At the end of 2015, the group had a total debt facility of £8m of which £5.75m had been used. So that leaves an extra £2.25m to be drawn down, which, when added to existing cash of £2.2m plus a possible 2016 operating cash flow of, say, £6m (it was £5m for 2015), gives a total of £10.5m. Given these 2015 results revealed £9.8m was spent on a net 12 new sites, I get the impression £10.5m might not be enough to fund 15 new sites. And even if £10.5m was enough, then repeating the feat for 2017 could be a challenge if the present £8m debt facility has been used entirely. For a comparison, ex-sister company Prezzo (PRZ) raised £16m from investors between 2004 and 2006 to take its estate from 35 to 98 restaurants — at which point the business became self-funding. TAST presently has 50 sites. I’m glad TAST’s expansion continues to accelerate and the group is now adding meaningful numbers of new outlets. As I’ve already mentioned, TAST plans to open 15 new sites in 2016 — up from a net 12 in 2015, an extra 8 during 2014, an extra 5 during 2013 and 2012, and an extra 4 during 2011. “Since the year end we have opened two more restaurants and a further two sites are under construction. The property pipeline is looking strong for 2016 and we expect to open 15 sites”. Meanwhile, some excellent research from a reader (thanks David!) pointed me to TAST job adverts citing 30 new openings during the next 18 months. Plus, it’s worth noting that TAST’s original Dim t chain has added one extra outlet. Serving Asian food, this brand did not catch on at first and it was mothballed by management a few years ago in favour of the more mainstream Wildwood pizza format. The Kaye family has already built and sold two multi-bagger restaurant chains (ASK Central for £223m in 2004 and PRZ for £304m in 2015) and I continue to see no reason why they cannot complete the hat-trick with TAST. PRZ was acquired early last year for £304m when it operated with 245 restaurants. Back in December 2004, PRZ had 48 outlets — equal to TAST’s 48 at the end of December 2015. So if TAST simply follows the success of PRZ, then the next 9-10 years could see TAST’s £87m market cap become £304m — equivalent to advancing 3.5-fold or 14% a year. The projected return could be lower of course. Factors to bear in mind include: i) PRZ carried freehold assets worth £33m (TAST does not own any freeholds), and; ii) PRZ’s net cash position was £14m (TAST operates with net debt). TAST’s trailing P/E is 35— so the downside could be considerable if a setback occurred and/or the expansion history of PRZ can’t be replicated. I suspect management’s comments of greater investment may limit near-term earnings growth — which could well keep a lid on the share price for now. Disclosure: Maynard owns shares in Tasty. Thanks for the excellent analysis and so quick off the mark. The Restuarant openings did slow in 2H but plans for this year look more aggressive. The hiring of additional Management will also add costs but that will bring needed horsepower to bring on the accelerated growth. Overall the long term looks bright but as you say maybe a lack lustre period for the share price in the medium term. I was interested to see 85% of shares traded yesterday were buys and much greater volume than usual yet the share price moved just 0.6%. On other days the price moves on a very little volume. Just to update the latest restaurant count. There are three brands: Wildwood, Wildwood Kitchen and dim-t.
As at 31 March, these websites listed 32 Wildwood, 11 Wildwood Kitchen and 7 dim-t outlets = 50 total sites to match the 50 stated in the FY results. An extra Wildwood Kitchen outlet has opened at Abingdon, Oxfordshire. As at 15 April, these websites listed 31 Wildwood, 11 Wildwood Kitchen and 7 dim-t outlets = 49 total sites — 1 less than the 50 stated in the FY results. It seems the Wildwood in Barnes, London has closed. As at 3 May, these websites listed 32 Wildwood, 11 Wildwood Kitchen and 7 dim-t outlets = back to 50 total sites. It seems a new Wildwood has opened in Letchworth, Hertfordshire. As at 5 May, these websites listed 33 Wildwood, 11 Wildwood Kitchen and 7 dim-t outlets = now 51 total sites. It seems that the Wildwood at Barnes, London has re-appeared on the website. As at 16 June, these websites listed 33 Wildwood, 12 Wildwood Kitchen and 7 dim-t outlets = now 52 total sites. It seems that a new Wildwood Kitchen at Ilkley, West Yorkshire, has opened. I compare TAST to PRZ as I hope the former will follow the latter as a very successful restaurant business managed by the Kaye family. Anyway, PRZ’s 2014 results give a more accurate picture of the group before its early 2015 purchase by a venture-capital business. PRZ finished 2014 with 259 restaurants (up from 237) and net cash of £15m. As such, you could argue the private-equity owner paid a net £303.5m (original purchase price) less £29.8m (sale and leaseback proceeds) = £273.7m for PRZ. That clearly gives less upside to TAST should it too ever reach 259 outlets. Just a follow-up on TAST’s option count. Potential dilution is not insignificant and could influence my projected return. So in total I reckon TAST has 4,164k options outstanding, plus 500k + 1,800k A shares, plus 600 B shares. That all gives 7,064k potential new shares, which represents a mighty 13.3% of the 2015-year-end 53,215k share count. I should add that not all of these options are held by the directors, and the board itself is very reasonably paid (highest salary £140k). Nonetheless, I think I will have to include the potential share-count dilution into my TAST valuation sums. I have had another look at this and believe I have miscalculated the potential dilution. The 500k A shares plus the 600k B shares plus the 137k CSOP shares issued during the year add up to 1,237k shares. Those 1,237k shares are included in the calculation to arrive at the 4,164k options outstanding at the year-end. The 1,800k A shares plus 222k CSOP shares issued during 2014 add up to 2,022k additional options — although the total options added during the year according to the accounting note above is 2,042k. The 20k difference looks odd, and if you go back to the 2015 option extract, 20k options were in fact cancelled during 2015. So overall, the additional A, B and CSOP options all add up and appear to be included in the 4,164k number. As such, the potential dilution is 4,164k on 53,215k year-end share count = 7.8%. Still not insignificant, but not 13.3%! I have been away so I am now catching up with my research. 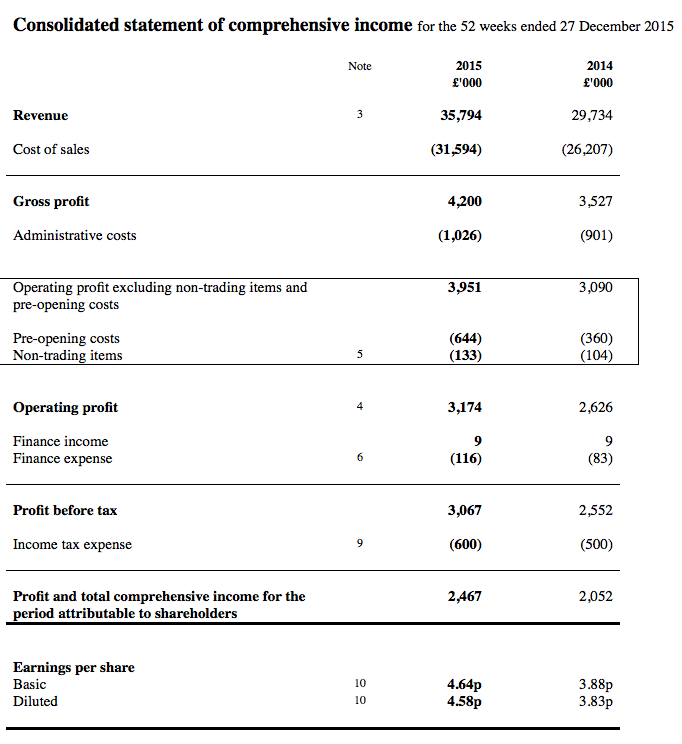 With 53,235k shares in issue and a price of 150p, TAST’s mkt cap is £79.9m. Year-end restaurants were 48, just like Prezzo (PRZ) in 2004. PRZ was bought in early 2015, so my simple theory is TAST can replicate PRZ’s subsequent 10-year expansion. PRZ was acquired for £303.5m, so my simple TAST ten-year mkt cap CAGR potential = 14.3%. But PRZ had freeholds that were sold immediately after its purchase for £29.8m. 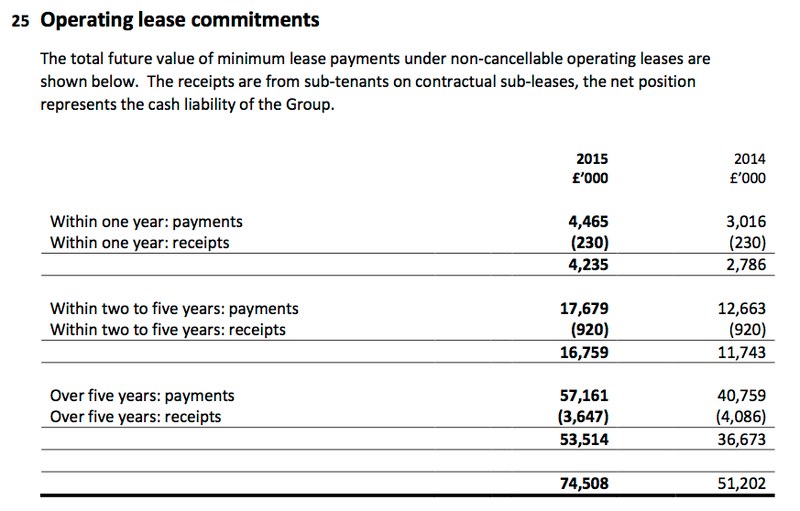 So the effective take-out PRZ mkt cap was £303.5m – £29.8m = £273.7m. So £79.9m to £273.7m over 10 years = 13.1% CAGR. But TAST has 4,164k options which will convert if the firm is bought. 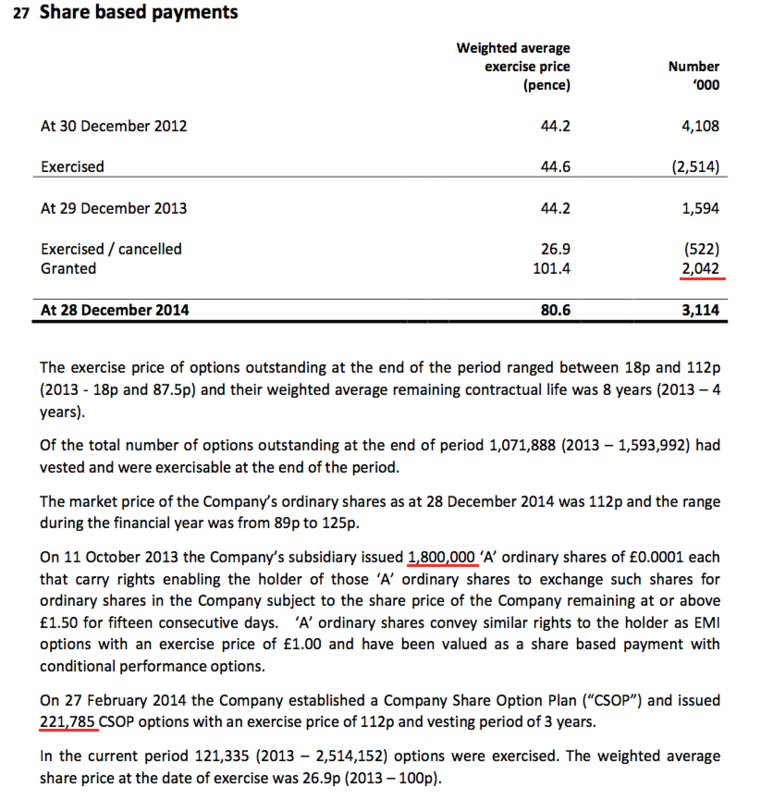 So TAST’s mkt cap including options is 53,235k + 4,164k = 57,399k shares * 150p = £86.1m. So £86.1m to £273.7m over 10 years = 12.3% CAGR. 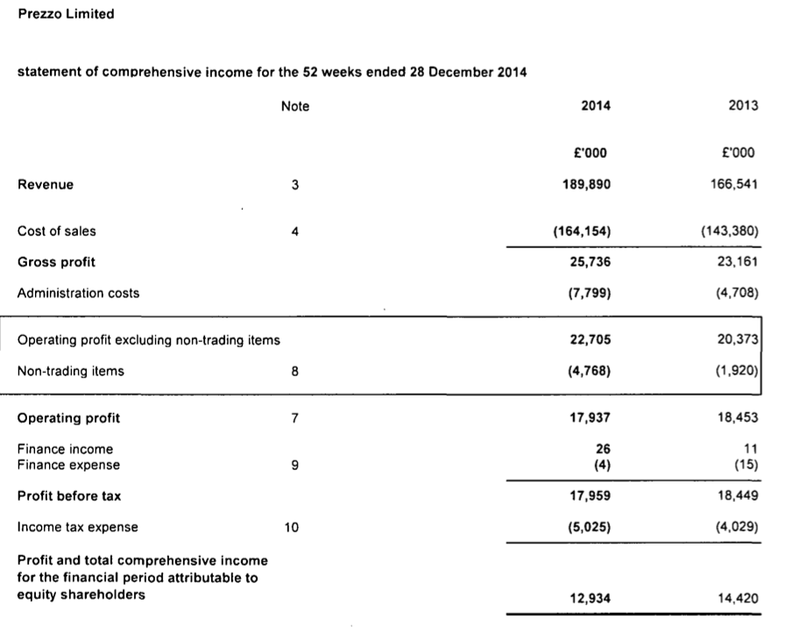 But TAST also currently has net debt of £3.5m, whereas PRZ always operated with net cash. So adding TAST’s current net debt to the current mkt cap adjusted for options (£86.1m) gives us £89.6m, and £89.6m to £273.7m over 10 years = 11.8% CAGR. FWIW, if you wanted to potentially achieve a 15% CAGR on that most conservative projection (i.e. adjusted for freeholds, options and debt), the share price has to be 111p. Boosting these CAGR calculations are potential TAST dividends, which may be paid sometime during the next 10 years (though perhaps not in the next few years at least!). But these are my rough projections at present. TAST is certainly going a different funding route to PRZ and some of its ratios are more attractive — and some of them are less attractive — than those of PRZ. Still, PRZ’s achievements and its takeover by private equity is the only real long-term guide we have for TAST right now. TAST’s comprehensive results RNS meant there was nothing of any significance left to be discovered in the subsequent annual report. However, I have now had time to look at a few items that I did not cover in my original write-up above. There is mixed news here. On the one hand, the average restaurant employee cost the firm £15,584 (£13,028k/836) — down from £15,929 for 2014. However, the same average restaurant employee produced revenue of £42,816 (£35,794k/836) — down from £46,899 for 2014. The £42,816 figure is the lowest since 2010. As such, the group’s total restaurant staff cost represented 38.7% (£13,028k/£35,794k) of total revenue — up from 34.0% for 2014 and 34.1% or less since at least 2007. It seems to me the new restaurants are employing slightly lower paid staff, but at present generating a fair bit lower revenue per employee. I wonder if this is purely a timing issue in terms of when restaurants are opened, or whether there is something untoward happening here. A quick comparison with Prezzo shows that ex-Kaye-owned chain never suffering a similar dip in the revenue/staff ratio. I will have to investigate this point further. Anyway, going on the average number of restaurants open during the year (42), I reckon the average TAST restaurant employed 19.9 staff members during 2015 (836/42). This ratio has been remarkably consistent over time, with 19.8, 19.5, 21.7, 19.8 and 19.8 the figures for the prior five years. I like to keep track of TAST’s lease costs and obligations. I note the P&L lease charge as a percentage of revenue kept steady at 10.5% (£3,765k/£35,794k) — versus 10.4% for 2014 and 11%-plus for 2012 and 2013. I also see the P&L lease charge per average restaurant operating open during 2015 was £90k (£3,765k/42) versus 97k for 2014 and £100k-plus for 2012 and 2013. Furthermore, dividing the total net lease obligation (£74,508k) by the year-end number of restaurants (48) suggests TAST is on the hook for future lease costs of £1,552k per unit. That compares with £1,422k and £1,428k for 2014 and 2013, but £1,620k-plus up to 2012. However, keeping lease costs under control may have been at the expense of lease length. The total net lease obligation (£74,508k) is 19.8 times the latest P&L lease charge (£3,765k). So you could argue TAST is currently on the hook for almost 20 years of lease costs. The calculations are 16.5x, 15.2x, 16.8x and 18.9x for the prior four years. I am pleased to see TAST’s debt costs have been lowered. For 2014, the group’s banking facility could lend £3m on flexible loan terms and £1m on a 3-year fixed term. The cost of the facility then was 2.95% above LIBOR plus 1.48% on anything not drawn down. I just found an article about the outlook of Restaurant Group struggling in part due to competition and the CFO leaving. Shares dropped 25% on Friday. Perhaps this is linked with Tasty share price increase? Somebody on ADVFN says TAST “was strongly recommended last night on a subscription website“. No clues given as to the website in question though. Just a coincidence the tip came out at the same time as the news from RTN I think. I attended this morning’s TAST AGM at the group’s dim-t restaurant in Hampstead. This was my second TAST AGM — I attended the event two years ago. As usual, this is my best recollection of what was said and my comments below are generally paraphrased. There was the opportunity to ask questions ‘from the floor’ after the formal meeting had ended, which is useful as I can then scribble down my notes. The chit-chat with directors afterwards can sometimes be harder to recall. Anyway, the board was in full attendance and included the newly appointed finance director. On reflection, I am not sure whether there should have been a resolution to re-elect him because it was his first AGM as a director. All the resolutions that were proposed were passed without fuss. There were six people in attendance, one of which was the auditor, three of which appeared to be staff (or acquaintances of the directors), A N Other shareholder and me. It was encouraging that A N Other came prepared with a few questions, so it was not just me quizzing the board. Joint chief exec Jonny Plant did most of the talking. * Jonny Plant: Plan for 15 new outlets this year, then looking to increase expansion to 20 a year. * Sam Kaye (joint chief exec): Still cagey on whether TAST can replicate scale and success of ASK and Prezzo (PRZ), long way to go etc. But it was “not outrageous” for shareholders to believe TAST could get to that size. * Jonny Plant: Use of the word “broadly” within the outlook statement (“current trading is broadly in line with expectations“) reflected a “slight blip” in H2 trading and the board felt it should indicate some caution. H2 sales “fell away“, especially in London, and no specific reason was offered save for TAST being sensitive to the wider economy. Paraphrasing here, Mr Plant suggested it was nothing to worry about that current trading was back on track. I was glad the board clarified there was an H2 sales drop, because my sums had suggested some loss of trading momentum. * Jonny Plant: £8m debt facility will need to be extended to fund 15 new sites this year. Will look at taking on more debt and/or as well as share placings to raise the money. * Tim Cundy (finance director): TAST will become self-funding at c100 restaurants, given the current plans of expansion. * Sam Kaye: dim-t and Wildwood units at Whitely (they are next door to each other in a shopping complex) are similar in terms of financial performance. Early days for both units. * Jonny Plant: dim-t has very targeted market and limited opportunities for openings in relation to Wildwood. * Tim Cundy: investment in central kitchen facilities referred to in the annual report will impact margins. Margins for 2016 will be “slightly down” on 2015, but benefits ought to be seen beyond that. * Jonny Plant: National Living Wage counteracted by lifting menu prices. * Jonny Plant: cost of new outlet c £680k. * Jonny Plant: New property director is ex-PRZ and was opening 30 sites a year. His knowledge of all the PRZ sites should help TAST’s expansion. Despite all the stories of high street doom and gloom, TAST is not finding much in the way of bargain leases for new openings. New openings can sometimes take only weeks to break-even, some can take many months. * Jonny Plant: Main risk of group’s expansion going wrong is mis-judging a location’s potential. Areas new to management come with some risk and there’s always a chance the management could over-estimate the potential. Cited the dim-t at Charlotte Street, London — under performed badly for 18 months after opening but recovered eventually though not that clear why. Everyone at board level was too optimistic, yet the unit was located in a very familiar area. * Jonny Plant: “No impact” on advent of Just Eat etc. Possibly different segment of the market. New digital marketing person monitors Tripadvisor feedback and handles online marketing etc. Admitted company had been slow to adapt an online presence. That’s all I can remember. On the train home I looked at my sums and wondered whether the H2 sales performance was more than a “blip” — I perhaps should have pressed more on that subject. Still, I am pleased the group is confident of lifting its opening rate to 20 units a year so things can’t be all that bad. Plus the disclosure of opening 100 units to become self-fundings is a useful benchmark. Finally, Sam Kaye was a just little more forthcoming about the potential of TAST — I seem to recall two years ago he was quite non-committal about the scale of the group’s ambitions. we are almost at the half year and with 52 Restaurant’s that’s only 4 opened this year which is slower than we were hoping for but it is growth! Yes, 4 new outlets at almost half-year, with 15 planned for the full year, does suggest the firm may be behind schedule. At least TAST have the former PRZ property director on hand to help things along. I must admit, on the one hand the rate of openings and the H2 sales ‘blip’ does make me a tad nervous. But on the other hand, it has generally paid to back the Kaye family and TAST has suffered blips before. …shows vacancies at Wildwoods at Lincoln, Sutton and Bournemouth — which all seem to be new openings. So three more outlets to add to the tally soon (I hope). …shows forthcoming openings at Crawley, Cheam and Lincoln. …suggests there are still jobs for Bournemouth and now Llandudno. So maybe another five new Wildwood sites are in the offing. As at 31 July, these websites listed 34 Wildwood, 12 Wildwood Kitchen and 7 dim-t outlets = now 53 total sites. It seems that the new Wildwood at Crawley, West Sussex, has now opened. As at 30 August, these websites listed 35 Wildwood, 12 Wildwood Kitchen and 7 dim-t outlets = 54 total sites. It seems that the new Wildwood at Lincoln has now opened. As at 5 September, these websites listed 36 Wildwood, 12 Wildwood Kitchen and 7 dim-t outlets = 55 total sites. It seems that the new Wildwood at Cheam, Surrey has now opened. I missed your AGM notes above, sorry about that. Very interesting and encouraging I feel, well done for going and sharing. I’m stuck in Singapore so no opportunity I’m afraid although it’s not bad here. I will be back in August for a couple of weeks when I plan to test TAST’s latest offerings, acid test with the Mrs as to whether success is on the cards. Today I visited Bow Street Wildwood near Covent Garden. First time there. From the outside my wife commented it looked a little dull but inside was very nice, upmarket feel and tastefully done. The staff were excellent, very polite and attentive. Food was hot and tasty and all three of us were happy although my Lasagne felt a tad small. To be fair our waitress advised me of this when I ordered and she suggesting adding a salad which I did. Nice little up sell for WW. Overall a very pleasant experience which exceeded expectations. Pricing was a little above ‘chain average’ but felt OK and maybe there is a premium cost for central London I’m not sure. I haven’t visited a WW for over 5 years living outside of the U.K. So it was a good exercise. I make the total openings this year 7 at month 9 and they were going for more than 1 per month so definitely somewhat slow. If there 3 to come that we know about that’s 10 so far this year at some point. They will want to get their ducks in a row in time for Xmas.